Members of Sands Rewards (“Members”) can enjoy the following discounts on the purchase of Cotai Water Jet city route adult full fare ticket when presenting a valid Sands Rewards membership card (hereinafter, the “Campaign”). Members of Sands Rewards (“Members’) can enjoy a discount on the purchase of Cotai Water Jet city route adult full fare ticket when presenting a valid Sands Rewards membership card (“Membership Card”). Each Membership Card can only enjoy a maximum of four (4) discount tickets per day. 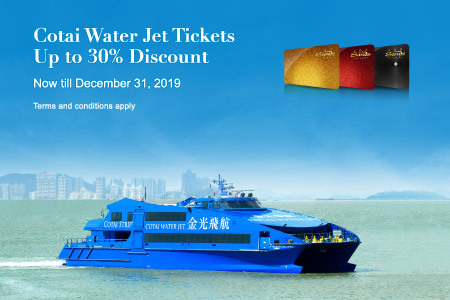 This offer applies to Cotai Water Jet city routes only. Hong Kong Macau Ferry Terminal to/from Macau Taipa Ferry Terminal. Hong Kong China Ferry Terminal to/from Macau Taipa Ferry Terminal. Member and the additional guest must arrive the gate together and travel on the same ferry. There is no restriction on the age of the additional guest. Member must present membership card for verification at the gate before boarding. If any deviation is found, Cotai Water Jet reserves the right to refuse passenger(s) onboard. All sailings must be completed on or before 31 December 2019. Cotai Ferry Company Limited reserves the right to pause, change or terminate this Campaign and these Terms and Conditions without notice. In case of any dispute related to or in connection with this Campaign and/or these Terms and Conditions, Cotai Ferry Company Limited and The Venetian Macao reserves the right to make the final decision.